For more than 40 years, IBM® mainframes have supported an extraordinary portion of the world’s computing work, providing centralized corporate databases and mission-critical enterprise-wide applications. The IBM System z®, the latest generation of the IBM distinguished family of mainframe systems, has come a long way from its IBM System/360 heritage. Likewise, its IBM z/OS® operating system is far superior to its predecessors in providing, among many other capabilities, world class and state-of-the-art support for the TCP/IP Internet protocol suite. TCP/IP is a large and evolving collection of communication protocols managed by the Internet Engineering Task Force (IETF), an open, volunteer organization. Because of its openness, the TCP/IP protocol suite has become the foundation for the set of technologies that form the basis of the Internet. The convergence of IBM mainframe capabilities with Internet technology, connectivity, and standards (particularly TCP/IP) is dramatically changing the face of information technology and driving requirements for even more secure, scalable, and highly available mainframe TCP/IP implementations. The z/OS Communications Server TCP/IP Implementation series provides understandable, step-by-step guidance about how to enable the most commonly used and important functions of z/OS Communications Server TCP/IP. 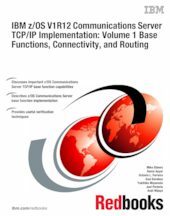 In this IBM Redbooks® publication, we provide an introduction to z/OS Communications Server TCP/IP. We then discuss the system resolver, showing the implementation of global and local settings for single and multi-stack environments. We present implementation scenarios for TCP/IP Base functions, Connectivity, Routing, Virtual MAC support, and sysplex subplexing.